So far, I've been able to get only the output sample rate and the output channels (i.e. CMD_AUDIO_OUT_SAMPLE_RATE_MESSAGE and CMD_AUDIO_OUT_NUM_CHANNEL_MESSAGE), but I can't find the commands to show the 3 infos I mentioned above, despite the fact that they are shown when pressing TAB for playback info. If it's not possible, is there any chance for those to be included (or have skin support) in a future PotPlayer release? P.S. 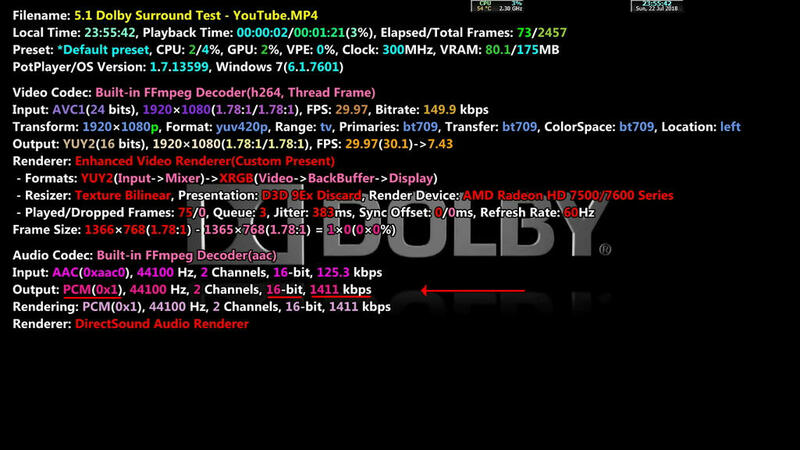 Somewhat related to this, why is the string output of CMD_VIDEO_OUT_SIZE_MESSAGE something like 1920×-1080? Is that minus sign in front of 1080 normal? Take a screenshot with the information (Tab) and mark what specific information you need. P.S. Please check the test skin I posted in my other reply from "[BUG?] Tab selection button...", it has the problem with CMD_VIDEO_OUT_SIZE_MESSAGE as well, for multiple files I tested (MPEG TS, MP4, etc). By the way, I only noticed this now: during the first milliseconds, the video output resolution height appears without the minus, but after a very small delay, the minus appears. I tested without the Text='...' part and the issue happens this way too. but fixed the "minus" in new beta. Ok, thanks for the info. Great job fixing the minus issue too.